AWAKEN POWER ------Strengthen Your Hand, Arouse Your Vitality. FitBeast Hand Grip Strengthener Forearm Grip Workout Kit (5 Pack), the essentials of your healthy life and say goodbye to expensive sports equipment. 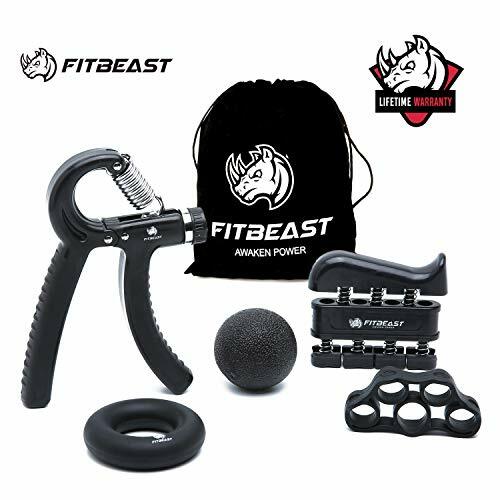 Why choose FitBeast Hand Grip Strengthener Forearm Grip Workout Kit? 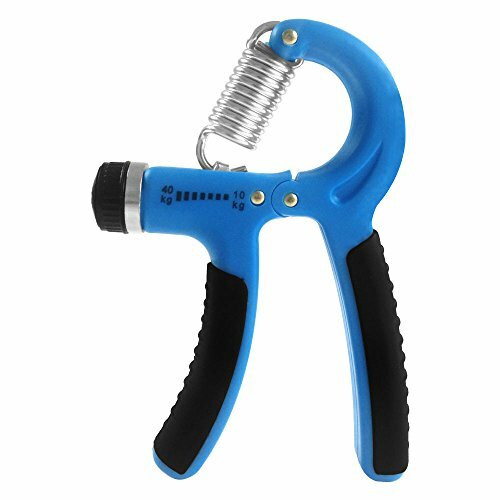 The forearm grip exerciser is perfect for increasing finger flexibility, coordination and building the strength of hands as well as the forearm. The grip strength trainer is beneficial to enhance strength, power, and speed in the wrists, fingers, and forearms. The hand grip strengthener is conducive to injury rehabilitation, recovery and stress relief. The hand grips strengthener is a comprehensive hand workout kit, which is effective. Comfortable and durable handle and easily adjustable. Why is FitBeast Hand Grip Strengthener Workout Kit the most comprehensive pack? 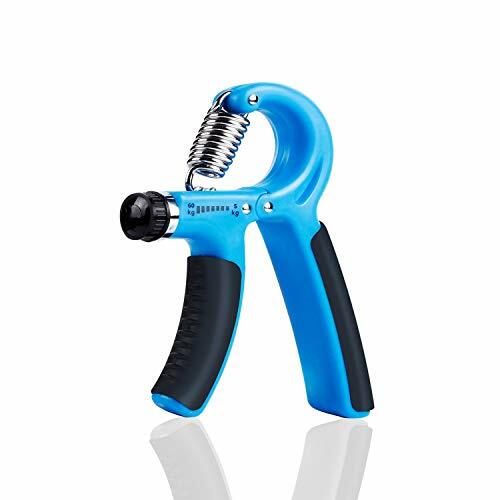 Adjustable Hand Grip Strengthener The hand grip strengthener applies an ergonomically design, which ensures it to be durable and easily adjustable from 22 to 132Lbs. Finger Exerciser This hand exerciser isolates each finger to strengthen individually, which prevents stronger fingers from helping weaker ones. Finger stretcher The intrinsic and extrinsic muscle groups can be strengthened by this finger stretcher. Hand grip ring 50lb hand grip resistance ring helps strengthen the users' handgrip strength. Stress Relief Grip Ball This exercise ball will enhance grip strength and dexterity. Stress Relief Grip Ball (Medium).  Suitable for Everyone : The hand grip strengthener forearm grip is perfect for improving strength, power and speed in the wrists, fingers, and forearms. An undoubtedly best choice for Rock Climbers, Tennis Players, Athlete and Musicians to enhance the flexibility of fingers and wrists.  Comfortable and Durable : The ergonomic and soft handle of hand grip strengthener is not only fit for small and large hands, seniors, and teens but also ensures comfortable holding. The resistance of hand grip strengthener is perfect for both men and women with different strength as it can be adjusted from 22 to 132lbs easily. You can use the grip strength trainer anywhere at any time.  Injury Rehabilitation : Using this grip strength trainer to work out every day is beneficial to recover in hand injury, rheumatoid arthritis, arthritis, carpal tunnel, tendovaginitis, fractured, broken wrist, and tendon surgery.  Hand Grip Strengthener Forearm Grip Exerciser Kit - 5 Pack : The hand grip strengthener 5 pack kit contains Adjustable Hand Grip Strengthener, Finger Exerciser, Finger stretcher Resistance Band, Hand Strengthener Grip Ring and Stress Relief Grip Ball, which can help strengthen and exercise your hand, fingers, wrist, elbows, and forearms.  Tutorial Video and Lifetime Warranty : All of our customers will be offered FREE and UNIQUE tutorial videos, which will facilitate you to make daily targeted training plans. Besides, each customer of FitBeast enjoys the Lifetime Warranty and Money Back Guarantee. 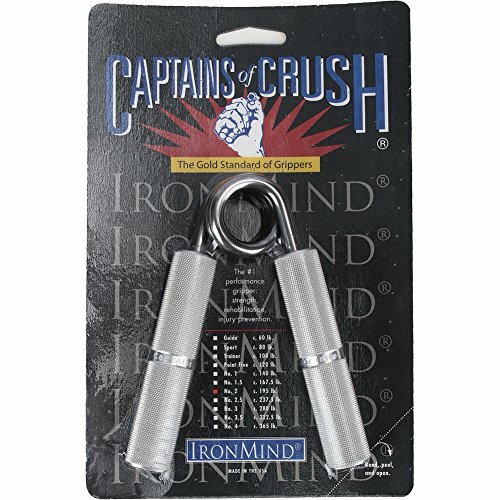 Known around the world as the gold standard for building and testing hand strength, Captains of Crush Grippers are the single most important grip strength tool you can choose--ready to produce the quickest gains in grip strength and hand health. Available in 11 strengths, there is a model perfect for everyone from rehab patients to World's Strongest Man competitors. These are the grippers that changed the world--never before had anyone taken grippers so seriously and pushed their development so far. Along the way, many of the biggest names in the strength world have shaken hands with and embraced CoC Grippers. Anything else is just a gripper. If increasing your grip strength is your goal, the ideal situation is to have three different grippers: one for your warm-ups, one for your work sets, and one that is your challenge gripper. 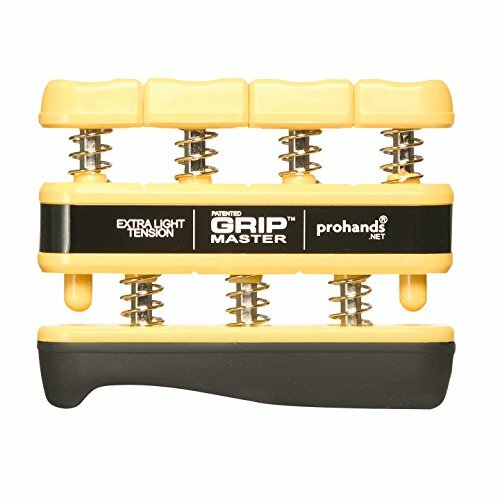 Brand: IronMind | Manufacturer: IronMind Enterprises, Inc.
>>From Pnrskter - America's Leading Health Care Experts Hand Grip & Finger Strengthener! - Easily Carry!! - Great Effective!! Great for Therapy, useful for physical or occupational therapy and rehabilitation. Why do you need Pnrskter finger exerciser? No matter you're working or exercising, you are overusing your gripping muscles while under-using your expanding muscles. Expanding muscles are the muscles that open your hands. Lacking of training these muscles cause imbalances that hurt performance & can cause pain & injuries such as carpal tunnel syndrome and tennis elbow. If you are musicians, golfers, computer workers, tennis players, baseball players, rock climbers, weight lifters, or if you drive, text or type, Try our finger exerciser. Build Strength, designed to increase the strength of fingers, wrists and forearms. Improve strength for weak hands - Improves strength, prevents stiffness and relieves joint pain. How to use finger exerciser? Tip 1: Place loops over each finger, starting with fingertips close together. Tip 2: Slowly spread the fingers apart, hold for 3 seconds, then relax them slowly. 1 to 30 repetitions in three sets. Hand Band Resistance Level: - GREEN: Light Resistance - For Beginners and Injured Hands. - BLUE: Medium Resistance - For Everyday Strengthening Exercise. - ORANGE: Hard Resistance - For Advanced Muscle Toning. Brand: Pnrskter 100% BETTER THAN MONEY BACK GUARANTEE Worry free purchasing if you are not satisfied we will refund you or send you a New One ! Usage And Caution 1. It can be reused and easy to clean with water or soap. 2. Air dry naturally or by paper, not the sun. 3. Inthe process of use, if you have any questions you can contact us immediately. We will answer your questions in the first time. What are you waiting for? Worth it! No Risk! ERGONOMIC DESIGN FOR ALL HANDS - Suitable for all age groups and fits well for all hand sizes, different from other small finger holes bands on the market. Portable and easy to fit in bag or pocket. You can get repetitions in while driving, at the office or anywhere! MAKE EXERCISE SIMPLE - Our finger resistance bands can improve finger strength for athletes (rock climbing enthusiasts, fitness, tennis, baseball, boxing, tennis, golf and shooting) and musicians (guitar players, bass players, pianists and violinists). See results fast using your new hand exercise equipment. THREE LEVEL FOR MORE NEED - Level1-Gray, Level2-Blue, Level3-Black. Use different bands based on force requirement. 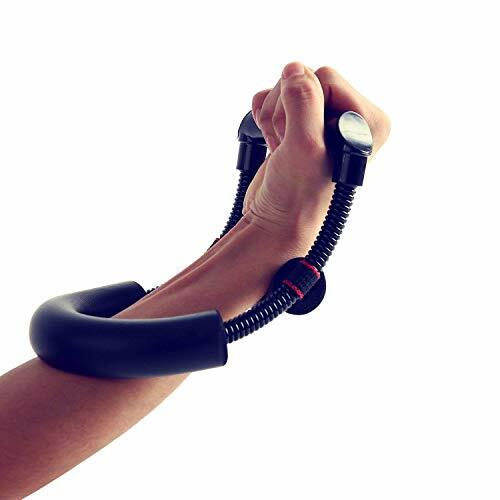 Squeezing the Luxon@ Adjustable Exerciser will work all of the muscles in your fingers, hands and forearm. Effective tool for injury prevention, injury rehabilitation, improving sport performance, improving ability to perform everyday tasks and for stress relief! 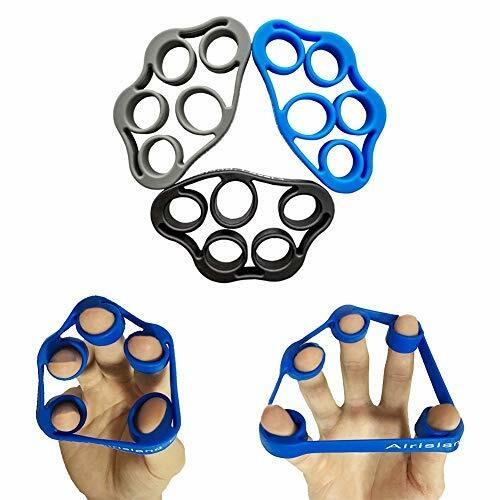 Use the GRIPMASTER Hand Strengthener, for outstanding hand, wrist, and forearm strength, critical to climbers. The consistent ability to securely grasp & lock onto a crag or burr is essential. 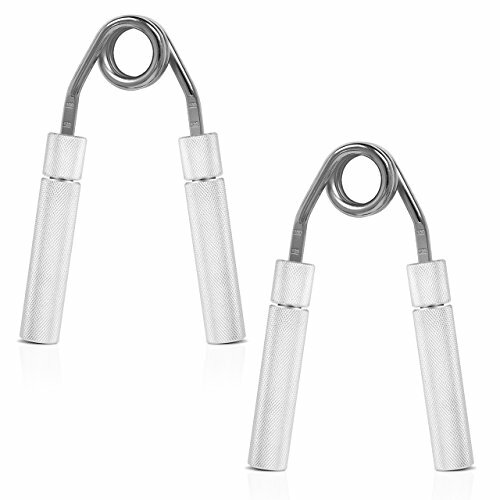 No other hand exerciser on the planet can isolate and develop each finger individually like the patented GRIPMASTER. Using GRIPMASTER every day will build the finger strength, endurance, and dexterity so imperative to climbers at all levels. Rated the #1 hand exerciser in the world, and recommended by Climbing Magazine and Rock & Ice Magazine. Available in 3 strengths, please order by color; Blue - Light tension (5 lbs/finger), Red - Medium tension (7lbs/finger), Black - High tension (9lbs/finger). Each unit comes with a full exercise program. It provides the resistance on each finger. And the finger stretcher will enhance lower grip strength by working your hand extensors. It is the highly effective exercise device for hand, finger, wrist, and forearm muscle development. HAND & FINGER EXERCISER - Perfect for musicians and sports enthusiasts. It will improve dexterity and performance. Best for treatment of patients with hand injuries, tendonitis, arthritis, carpal tunnel, tennis elbow. Accelerates blood circulation. ADJUSTABLE RESISTANCE - Easy to change and allows a wide variety and range of exercises for a wide range of age groups and fitness levels by screwing or unscrewing the knob to adjust spring tension from 22lbs/10kg to 88lbs/40kg. Ergonomic design fits all hand sizes for men, women, seniors, kids. Grooves in the grip provide maximum comfort and prevent the gripper from slipping. HIGH EFFECTIVE USAGE - This designed to improve strength, power, and speed in your hand, fingers, wrist, elbows, and forearms. And help you recover from the hand injury, arthritis, carpal tunnel, and tendonitis. GREAT GIFT - This is a perfect gift choice for someone is sports athletes, musicians, rock climbers, tennis players, golf players, boxers, drummers, guitarists, pianists and much more. It is made portable to take along anytime and any day. 100% SATISFACTION GUARANTEED - We believe in quality. Our hand strengtheners are made to last long durable construction and keep its premium look. Your max satisfaction is guaranteed. Why choose our hand grip strengthener?-Quickly increase hand wrist finger forearm strength with the best hand exerciser. 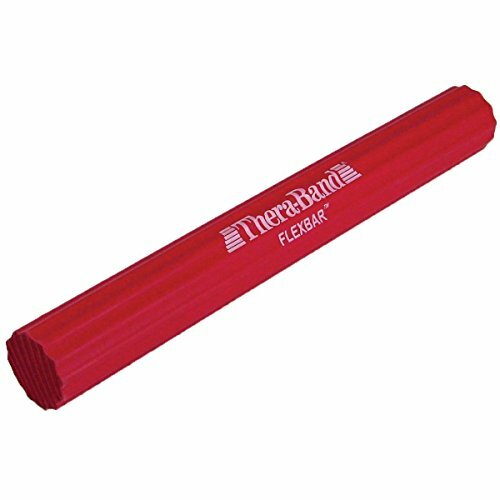 Ideal for improving strength, power and speed in the wrists, fingers forearms, hands. Ideal for athletes, musicians, rock climbers, golfers, bodybuilders and tennis players. Ergonomically designed to fit small to large hand sizes. Perfect for men, women, seniors and teens. We can choose from various resistance level. There Are ones for beginners as well as for advanced users. Built with the best quality materials and enhanced strong spring to endure long-term and frequent use.-Lightweight and portable. Easily pack it in a purse or briefcase and workout on the go or relieve stress at your desk. Specifications material: Stainless steel & rubber resistance range: 22-88 lbs. (10-40kg)size: 4.4 x 0.9 x 6 inch weight: 5.4 ounces package included1 x hand grip strengthener. HIGH QUALITY MATERIALS : It is uniquely designed to endure long-term and frequent use. Comes assembled and ready to use! It offers all the rehabilitation and hand grip strengthener you will ever need. 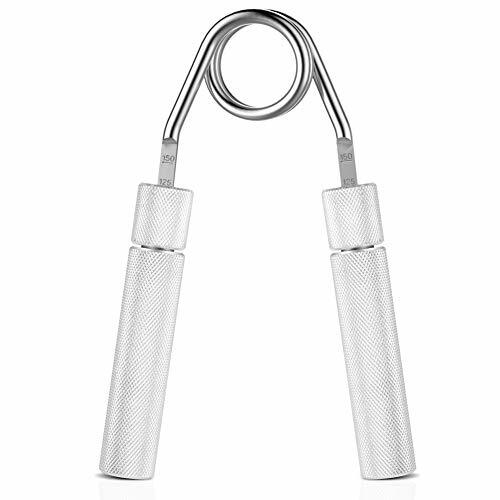 HELPS YOU TO : IMPROVE Grip strength / Fingers / Forearms / Wrists Strength. Best choice for Rock Climbers, Tennis players, Guitar, Piano, Drummers & Musicians, Bodybuilding, Atheletes, Golf Players, Boxing, Bikers. It can also be used for Hand Therapy, Rheumatoid Arthritis, Occupational Therapy(OT), Computer users, RSI, Trigger Fingers Wrist Injury, Surgery, Hand Rehab, Carpel Tunnel Relief, Wrist tendonitis, Tennis Elbow, Joint Pains, Stiffness, Release Daily Stress and SO MUCH MORE! THE BEST CHOICE : Ergonomic Design For All Hand Sizes - Fits for small and large hands, men, women, seniors and teens. Easily fits into your gym bag or hand bag. You can use it at home or in meetings, office or classrooms, you can get repetitions anywhere, super easy to use! PERFECT forearm grip workout GIFT for FAMILY and FRIENDS! 100% CUSTOMER SATISFACTION : Becouse customer satisfaction is the highest priority we offer 10 YEARS WARRANTY for Mandrill grip strength trainer. Quality is our main concern and your experience with the products is our guideline. LDGFLY Hand Exercise Kit Why choose our hand exercise kit. 1,Most comprehensive and effective workout kit that satisfies all your needs. 2,Gains strength in hands, wrists, fingers and forearms for better performance. 3,Improves finger strength and dexterity, perfect for athletes and musicians. 4,Contains different hand exercise equipment that target on different hand muscle groups, allows exercises on small muscles in your hands and arm that may be missed. 5,Good for rehabilitation. Speed up recovery from arthritis, tennis elbow, rheumatoid arthritis and carpal tunnel or hand, shoulder, finger surgery. 6,Reduce joint pains, stiffness, release daily stress and increase blood circulation for people who have longtime typing, mouse working jobs. 7,Portable and lightweight. Easily to be put in your gym or hand bag. 8,Ergonomic designed for both small and large hands, men and women. 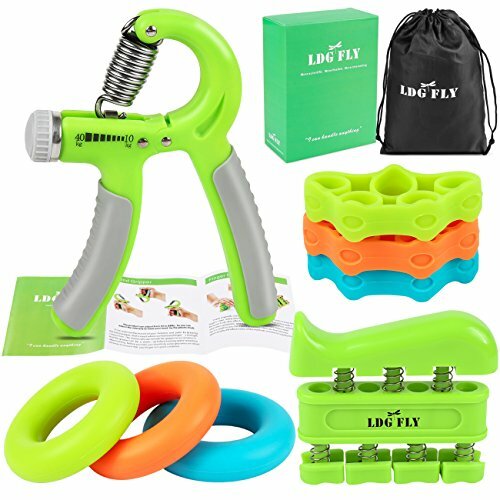 SUPER PACK HAND STRENGHENER Kit: Adjustable Hand Grip Strengthener (22-88 Lbs) + Finger Hand Exerciser (4 Lbs resistance each finger) + Finger Stretcher (Green 6.6bl, blue 8.8bl, orange 11bl)+ Exercise Ring (Green 30bl, blue 40bl, orange 50bl ) + Carrying/Storage/Protective Bag + Instruction Manual. IDEAL STRENGTH TRAINER PACK : Improve Hand Grip / Fingers / Forearms / Wrists Strength. It's used by Rock Climbers, Tennis players, Guitar, Piano, Drummers & Musicians, Bodybuilding, Atheletes, Golf Players, Boxing, Bikers. It can also be used for Hand Therapy, Rheumatoid Arthritis, Occupational Therapy(OT), Computer users, RSI, Trigger Fingers Wrist Injury, Surgery, Hand Rehab, Carpel Tunnel Relief, Wrist tendonitis, Tennis Elbow, Joint Pains, Stiffness, Release Daily Stress and SO MUCH MORE! PORTABLE AND LIGHTWEIGHT PACK: Ergonomic Design For All Hand Sizes - Fits for small and large hands, men, women, seniors and teens. Easily fits into your gym bag or hand bag. You can use it at home or in meetings, office or classrooms, you can get repetitions anywhere, super easy to use! PERFECT GIFT for FAMILY and FRIENDS! HIGH QUALITY MATERIALS: It is uniquely designed to endure long-term and frequent use. CONVENIENT & USER FRIENDLY: Comes assembled and ready to use! It offers all the rehabilitation and strengthening you will ever need. Hand grip exerciser also work great for rehabilitation. If you suffer from rheumatoid arthritis, arthropathy, tendonitis, carpal tunnel, tennis elbow and are on the way of recovery from a fractured or broken wrist, or tendon surgery. Constructed to be durable and offers users a top quality design with aluminium alloy, comes with adjustable ring that can be adjusted to 5 different resistance levels (50-75-100-125-150 Lbs. ). How to adjust: Turn the fixing ring counterclockwise, slide the handle along the adjuster bar, then fix the ring at your expected resistance level. 1. The strength of your hands, fingers, wrist, and forearms will be trained and improved by Our hand squeezes. 2. Hand trainer is perfect for those people who have Arthritis, Tendonitis, Carpal Tunnel, etc. 3. Hand grip equipment Also a wonderful gift for musicians, athletes, golfers, rock climbers and tennis players. 4. Hand strengthener providing resistance on each finger which is ideal to enhance and improve hand gripping power and also finger's power, and speed. HAND & FINGER trainer - Improve strength of your hands, fingers, wrist and forearms, perfect for those people who have Arthritis, Tendonitis, Carpal Tunnel. And also great for musicians, athletes, golfers, rock climbers and tennis players. Great for enhancing hand and finger grip strength, endurance, dexterity, muscular tone and fine and gross motor skills. Resistance Adjustable - Very easy to adjust by a screw cap from 11lbs/5kgs - 132lbs/60kgs. Almost no noise! Longang hand strength is suitable to do your excise at anywhere, at home, workplace, or even on an airplane without bothering those around you. 100% SATISFACTION GUARANTEED - We provide with 360 days money back without any question asked and no hassles. After sales: 3 years warranty. Free for new. The main purpose: to exercise the muscles of forearm wrist grip wrench climbing climbing strength badminton table tennis basketball weightlifting school examination and so on a series of training. Recommended that the number of pounds to use the right hand is different. 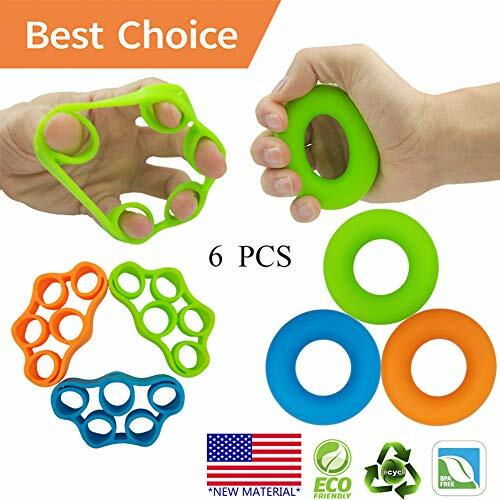 Heavy Grips Hand Exercisers - Hand Grippers for Beginners to the Most Seasoned Professionals The Heavy Grips hand gripper series was developed for athletes who want to take the training of their grip strength to the next level. 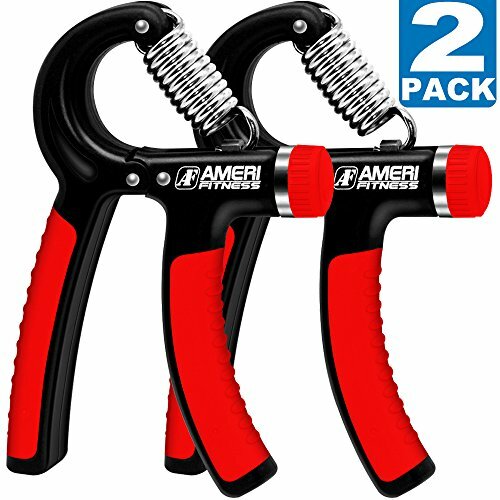 These high quality aluminum-handled hand-grippers are crafted with 50 inch-force-lb torque increments from 50lbs to 350lbs so that you can train your grip similar to training any other bodypart-- by increasing resistance. This will finally allow you to build the huge forearms and crushing grip you have been unable to achieve by doing endless reps with plastic-handled hand-grippers. 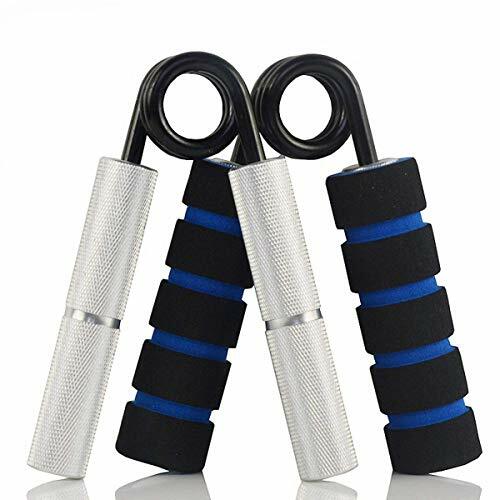 Ergonomically solid aluminium handles with knurled coating for a non-slip grip,12 different strength levels for beginning, intermediate and advanced training (100 lbs-350lbs) Reasonable price and high quality. 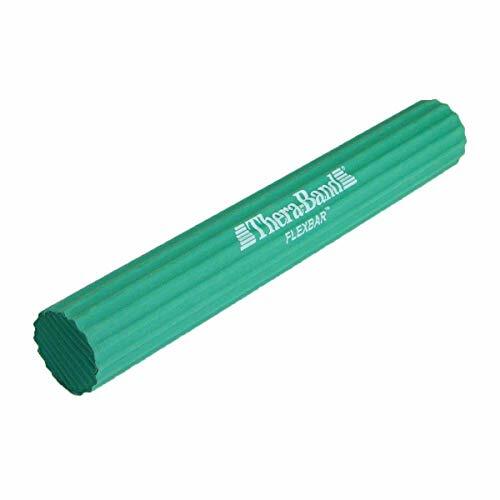 Used for hand strength, stamina, rehab and injury prevention,Perfect to increase massive forearm muscles, hand endurance and dexterity,Provides resistance to help develop muscles in hands, arms, wrists, forearms, and fingers for increased strength.The grip is guaranteed for one year. The accessories are not warranted. Great for improving daily function, such as opening and closing jars, or rehabilitation after an injury. Why choose the Kootek Hand Grip Strengthener? -Ideal for rock climbers, bodybuilders, golfers, surfers, tennis players, drummers, guitarists, pianists, massage therapists, baseball players and violin players. Also beneficial for people who have arthritis, tennis elbow, rheumatoid arthritis, and carpal tunnel syndrome. -They train your fingers, hand grip and forearm effectively. That leads to better workouts, and you can avoid several injuries. -We can choose from various resistance level. There are ones for beginners as well as for advanced users. -Built with the best quality materials and enhanced strong spring to endure long-term and frequent use. -Typically they are small equipment so you can use them when and wherever you want.